An enthralling programme, a mix of challenging 20th century works and a repertoire staple, is typical of what I have come to expect from Musikfest Berlin. 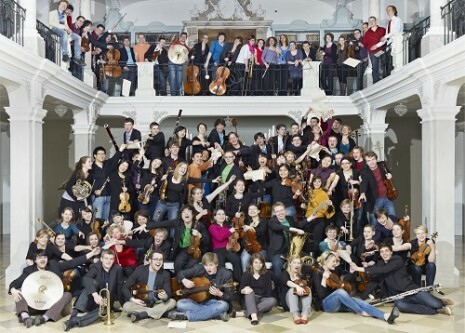 Established in 1974 and based in Frankfurt am Main the Junge Deutsche Philharmonie is comprised of players from German language music academies. Taking the baton was Jonathan Nott who from 2014 has served as its principal conductor and artistic advisor. I know a few concert goers who avoid youth orchestras but from my experience they face missing out on frequently excellent music making as was clearly the case with this Sunday Matineekonzert at the Philharmonie. Written in the early 1950s whilst he was living in the United States Varèse’s Déserts is scored for 20 players comprising of 10 brass, 4 woodwind, 1 piano and 5 percussion. The addition of electronic tape to the score felt like a mix of mainly industrial, urban street and underwater sounds. Lasting around 25 minutes the revised score from 1960/61 feels fresh and virile generating a cool, razor sharp sound world including an abundance of cacophonous outbursts. Jonathan Nott knows his Ligeti well having recorded a number of the composer’s scores with the Berliner Philharmoniker for Teldec. Here Nott was joined by soloist Pekka Kuusisto for the Transylvanian born composer’s Violin Concerto a work far more accessible than one might imagine. Using the 5 movement 1992 revision Nott’s chamber sized orchestra employed 11 strings, 9 wind and 4 percussionists with Pekka Kuusisto as violin soloist. Beautifully written the score contains its fair share of dramatic turbulence and agitation contrasted with episodes of tender emotion including the song-like passage of the second movement Aria. Enthusiastic and full of personality Kuusisto displayed his prowess with a resolute performance revealing the huge palette of colour in his armoury. The main work of the concert, Beethoven’s Symphony No. 3 ‘Eroica’, is music of considerable concentration and, as the designation suggests, heroic power. Beethoven originally dedicated this progressive score to Napoleon Bonaparte before tearing up the page and replacing it with the title ‘Eroica’. A warhorse of the repertory frequently performed in the concert hall, over the years I have attended numerous performances of this masterwork. For all the wrong reasons I particularly remember a 2011 Munich performance of the ‘Eroica’ by the touring New York Philharmonic that felt as if this renowned orchestra had slipped into holiday-mode – such was its jaded and uninspired playing. Under the baton of Nott, a stylish conductor of real integrity, no lacklustre performance was allowed to happen with his splendid youth orchestra. In the opening movement, containing an abundance of contrasting calm and storm, Nott provided a clean precise attack with ample buoyancy which felt so appropriate. The serious tread of the persuasively performed Marche funèbre felt more than an expression of grief. In between the slow sections Nott broadened the dynamics daringly and the results were stunning. Sparkling and energetic with actively sprung rhythms the compelling playing of the Scherzo was enough to excite even the most jaded disposition. In the Finale there was plenty of rhythmic vitality which left a satisfying sense of drama. Overall this was not a performance of the ‘Eroica’ that could be described as thunderous, of blood and guts. Nott and his young players convincingly provided a vibrant sound of glowing intensity – and how refreshing it all felt!